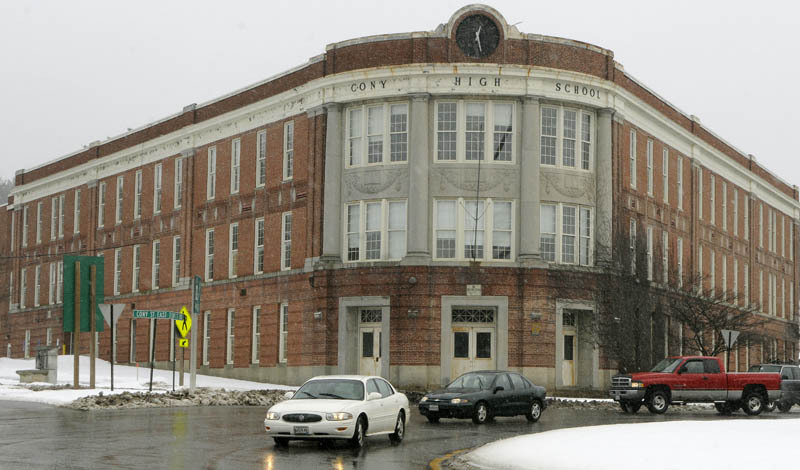 Housing Initiatives of New England says it needs a city tax break, as well as state and federal housing funds, tax credits and rental income, to convert the former Cony High School building to senior housing. 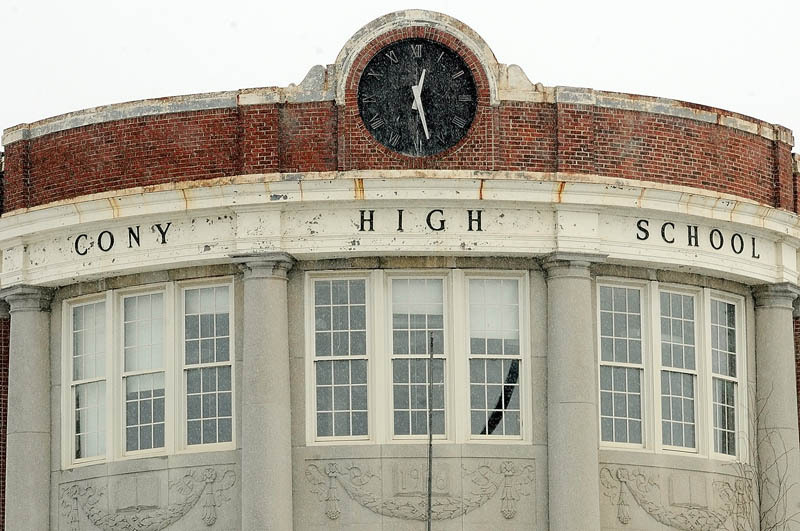 AUGUSTA — The future of the vacant old Cony High School flatiron building could be elderly housing development funded by a combination of state and federal housing money and historic preservation tax credits, grants, rental income and a tax break. The funding hodgepodge is necessary to finance the redevelopment of the unique, city-owned building that looms over Cony Circle, according to city officials and the project’s potential developer. Renovations would cost nearly $8.7 million. “My passion is historic preservation, so to preserve this building, renovate it and bring it back to life and give back to the community would be rewarding,” said Cynthia Taylor, president of nonprofit housing developer Housing Initiatives of New England, which submitted the only response last year to the latest of a series of requests for proposals issued by the city to redevelop the former school. The building has been empty since it ceased to be used as a school when a new Cony High School opened in 2006. Since the old school closed, the city has tried numerous times to find a developer to renovate the structure for new uses. Despite initial interest from multiple potential developers, however, none came forward with proposals after each failed to come up with a business plan that they thought could work. Taylor proposes to lease the building from the city for 49 years and develop the former classrooms and most other spaces in the triangular-shaped building into 44 one- and two-bedroom apartments for elderly residents. Of the 44 units, 16 would be two-bedroom and 28 would be one-bedroom. Also, 27 units would be for elderly residents with a household income of no more than 50 percent of the area’s median income, or about $20,000 a year; and the other 17 would be for elderly residents with a household income of no more than 60 percent of area median income, or about $24,000, according to City Manager William Bridgeo. Rent would range from $500 to $729 per month, according to documents filed with the city by the developer. Taylor and Housing Initiatives have had success creating elderly housing in historic structures in Augusta already. In 2000, they converted the former riverside city hall, which was also was Augusta’s police station, into the Inn at City Hall, with 31 assisted-living apartments. Housing Initiatives of New England also owns Kennebec Plaza, next to the Inn at City Hall. Taylor said there is a demonstrated need for more elderly housing in Augusta, and Kennebec Plaza, the Inn at City Hall, and the Cony flatiron building would serve residents with different needs and incomes. The city would lease the flatiron to Taylor’s firm for 49 years for a nominal $1 a year. The city spends about $75,000 a year to heat the empty building minimally and maintain it, and those costs could rise, because the roof has some leaks, according to City Councilor Michael Byron. While Housing Initiatives is a nonprofit operation, Byron said a for-profit corporation would be established for this project, because a nonprofit would not be able to take advantage of the federal and state tax credits for housing and historic preservation necessary to make the project financially viable. Taylor also is seeking a tax-increment financing deal, called a TIF, from the city to get back most of the real estate taxes the developer would pay as a long-term leaseholder of the property. Byron said the proposed tax break would return all but $4,000 of the potential $36,000 in estimated yearly taxes, for 30 years. The city’s TIF Committee — composed of Byron, Councilor David Rollins and Mayor William Stokes — met with Taylor Friday and agreed to support the TIF proposal, which is expected to go to the full City Council for a vote March 14. Byron and Taylor said that without the TIF and state and federal tax credits, no development is ever likely to occur at the flatiron site. The redevelopment plan includes preserving and refurbishing the auditorium on the building’s third floor. Preserving the auditorium was a key desire expressed by numerous residents — many of whom attended high school there — during planning for the reuse of the building. Taylor said she could see the auditorium being used by schoolchildren who need space for dance recitals, or as a lecture hall for civic groups such as the Boy Scouts.